Nooteboom Trailers, producer of trailers for special transport, presents its trailers at many trade shows every year in Europe and beyond. The stand crew captures leads with a digital form. The leads are automatically processed for the follow-up procedure. At trade shows such as Bauma and Scotplant, Nooteboom mans a booth with up to 25 people. Xander Kamphuis: "In the old days, lead capture was done on sheets of paper. Processing the leads took 2 days. We can do a lot better now." For Nooteboom it is important to quickly process a completed lead form. "In almost all cases you speak with someone who does business with a colleague," Xander explains. With their self-made digital lead form, MoreApp automatically sends the lead information to the right salesperson so the follow-up procedure can be started. 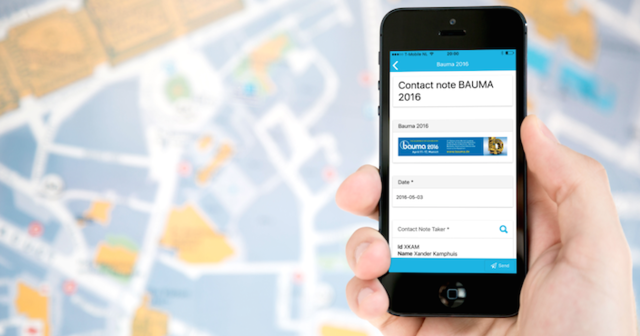 With their digital lead form, Nooteboom saves an extra employee per trade show by using our lead capture app. This employee was typing over handwritten sheets of paper into the computer. Xander finds it a great advantage that the app users can now make choices in a form. Xander: "The data is also easy to analyze after an event. Because of the digital and structured way of capturing, I immediately get an accurate overview of the sales opportunities."